On August 17, 1977, the Russian nuclear icebreaker the Arktika sailed to the geographic North Pole. Forty years later, its younger brother, the 50 Let Pobedy icebreaker made the same trip. Those who were on the most recent voyage took the time to admire the breathtaking view ¬– and revel in how much oil was sitting under it. On August 17, 1977, the Russian nuclear icebreaker the Arktika sailed to the geographic North Pole. Forty years later, its younger brother, the 50 Let Pobedy icebreaker made the same trip. Those who were on the most recent voyage took the time to admire the breathtaking view ­– and revel in how much oil was sitting under it. 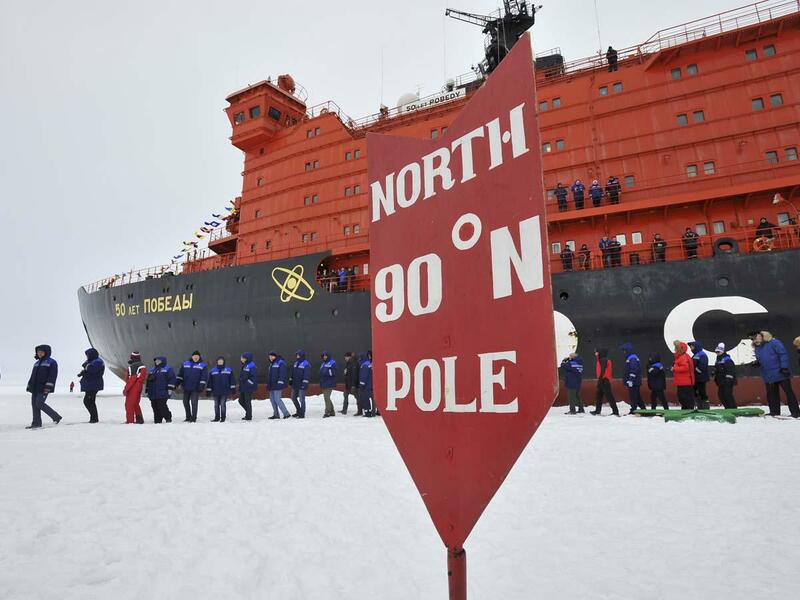 According to a release from Rosatomflot, Russia’s nuclear icebreaker fleet, the 50 Let Pobedy set out earlier this month to duplicate the earlier trip to the North Pole – and it was quite a party. 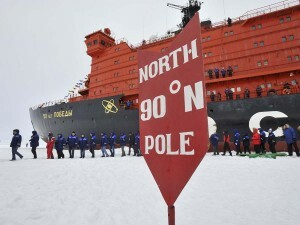 Aboard the ship were parliamentary deputies, members of the Federation Council, representatives of the state nuclear corporation Rosatom and the icebreaker fleet, other public servants as well as a few of the participants in the original pole bound voyage. Joining this company were wives, children, in-laws, kids who won contests for drawing the best visual depiction of atomic energy, honor-roll students who were bound for the Murmansk Naval Academy, singers, actors, and stand-up comics. And what party would be complete without an Orthodox priest praying for the safety of those on board and blessing the journey along the way? They had one of those, too. 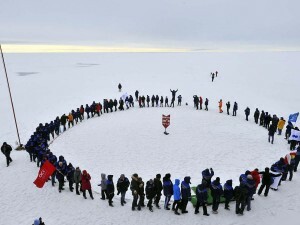 At the subsequent press conference to share their impressions voyage, everyone expressed their genuine enchantment with Arctic nature, and topped it off by reading official speeches about how government support was needed to drill it for oil. “We spent nine days without telephones or other means of communication,” one parliamentarian recalled. “We breathed the freshest air on the planet – and when we alighted on the North Pole we weren’t even allowed to smoke there. It was impossible not to get carried away with the natural beauty. We now understand that we won’t see anything more beautiful in our lives. The breathless remarks were echoed by all the other officials standing behind the microphones, and the assembled journalists couldn’t have been happier for them. But even after all these public servants had seen on their trip to the top of the world following in the footsteps of their forbearers, every single one of them came to the same conclusion: We have to develop this place. And not just develop it, but drain it of every fossil resource and turn it into a highway of hydrocarbons to Asia because Europe has become a lousy customer. And with this voyage, Denis Krevchenko, a Duma Deputy with Putin’s United Russia party, said he and his fellow parliamentarians were given the opportunity during their summer vacation to conquer the Arctic. Deputy Denis Moskvin, also of United Russia, expressed his certainty that serious investment is needed to explore and drill for fossil fuels in the Arctic. Konstantin Kosachyov, a senator on the Federation Council, thanked Rosatom and Rosatomflot for the experience of the voyage, and underscored that this was no mere tourist trip. He opined that the Arctic needs government care, attention and oversight – so that the Arctic can be drilled as well become a trade route so Russia can deliver the oil it discovers there. 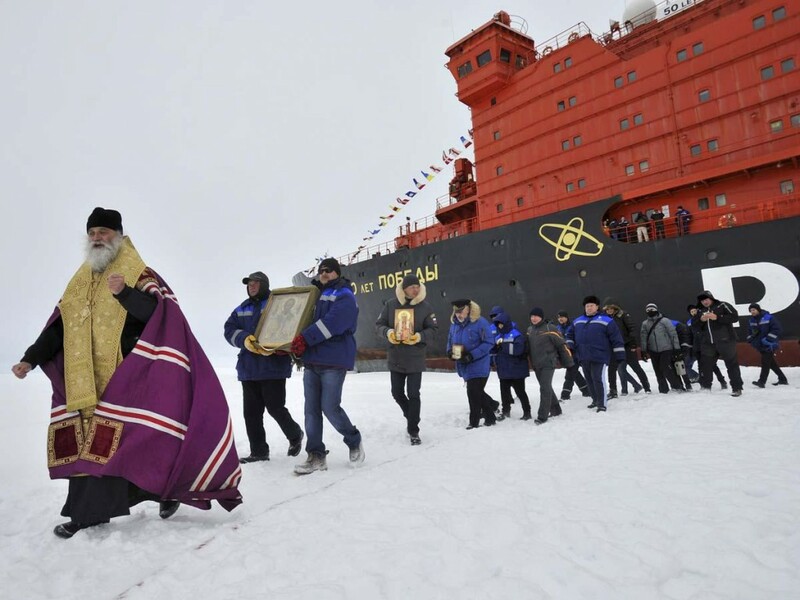 He included a plug for his hosts with Rosatomflot: “The only way to transport petroleum from the Arctic is with the help of the nuclear icebreaker fleet,” he said. It was evident that the Arctic had had a bewitching effect on the parliamentarians. They were so inspired that they raised a theme so sensitive and inconvenient in the lead up to an election year: what the future of Russia should look like. For the past few months, Russia’s political class has been trying to formulate an idea of what that stunning future must look like. And it sounds as if they fresh air and beautiful scenery they experienced on their trip to the North Pole gave them some ideas: Whatever that future holds, its impossible without developing the Arctic and ruining all the pretty scenery they so enjoyed. It’s sad that nine days spent in the severe but vulnerable and beautiful conditions of the Arctic didn’t inspire at least one politician to speak up for defending and preserving it all. Unfortunately, as the Russian experience shows, the environment in all of the country’s regions has been destroyed and will continue to be threatened by oil hungry politicians show up.